The relationship between President Trump and Secretary of State Rex Tillerson has seemed rocky for some time, and it appears tensions continue to escalate. 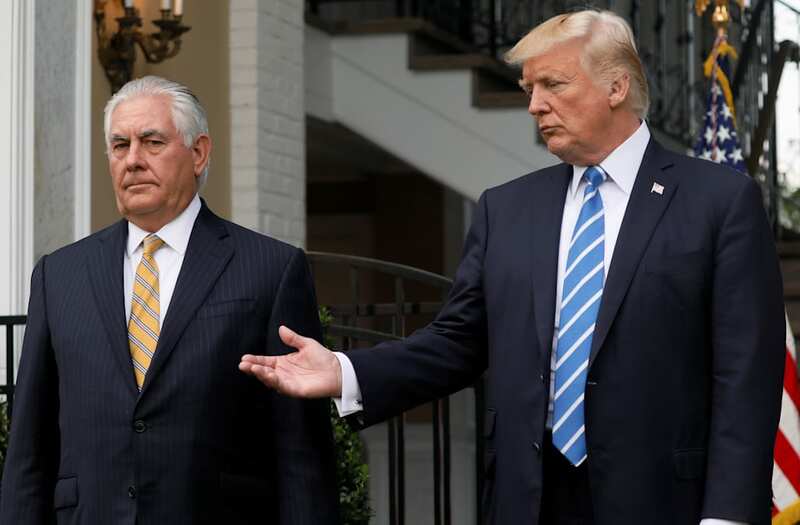 Axios reported Sunday, citing inside officials, "Trump is getting more and more fed up with Tillerson." As an instance of Trump’s growing frustration, the publication notes, "one time recently, after Trump had returned from a meeting on Afghanistan, a source recalled Trump saying, ‘Rex just doesn’t get it, he’s totally establishment in his thinking.'" Among other recent signs of fraught times between the two is Tillerson’s answer to a question about Charlottesville. In an appearance on Fox News Sunday, host Chris Wallace asked the secretary of state what the president’s response suggests in regards to American values. Tillerson said, "I don’t believe anyone doubts the American people’s values or the commitment of the American government, or the government’s agencies to advancing those values and defending those values." Wallace followed with, "And the president’s values?," to which Tillerson replied, "The president speaks for himself." Over the past months, Tillerson and the White House have reportedly been at odds on a number of important matters. According to inside sources, they include the issues involving sanctions on Venezuela and the Iran nuclear deal, notes Axios.